Conca Dei Marini is a lovely little fishing village of roughly 700 people, situated strategically between Amalfi and Positano in the Gulf of Salerno. Conca, as the village is dubbed, remains close to our hearts because Exclusive Cruises calls this their primary base during the summer months. 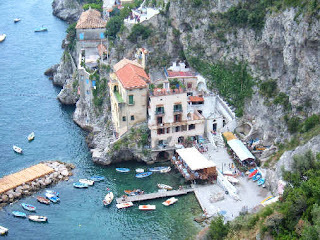 If you are traveling to the Amalfi Coast/Sorrento/Naples/Capri areas, do not miss a stop in Conca dei Marini. Simple beauty, extreme luxury, breathtaking views and out-of-this world cuisine, Conca is a slice of paradise that has (luckily for locals and visitors alike) kept it’s old-world charm and values. The locals of Conca are a close-knit community, sharing their homegrown crops, freshly caught fish, homemade liquors and much more. Since Conca is a “verticle town” there are many stairs and hidden walkways leading to tiny stucco homes, delicious smells of traditional cooking seeping out of every door, and fabulous views of Li Galli Islands, Capri and Praiano on one side, Amalfi, Maiori and Salerno on the other, and the Cilento Coast directly across the Mediterranean. The beach in Conca (I call this my “happy place”) is a hidden gem all on it’s own. Rent a lounge chair and relax in the sunshine on the beach or the man-made solarium. The solarium has a wonderful breeze and always seems to maintain the perfect temperature. Swim in the turquoise water…. since Conca, (Conca means “shell” in English), is situated in a quiet inlet, the water is always clean and clear. Hungry? Choose from three delicious and genuine family operated restaurants on the beach for a full barefoot luxury experience. It was on this beach that Jacqueline Kennedy chose to spend her days during the summer of 1962, at the private villa of Gianni Agnelli. If you are looking for a more luxurious experience, the five star, luxury hotel Monastero Santa Rosa sits high on a cliff overlooking the Mediterranean, with an infinity pool stretching out to the horizon. This 17th century monastery was purchased by American Bianca Sharma, and completely restored- maintaining it’s original structure and style. The story goes that Sharma first spotted the monastery while boating along the coastline! (People see much more while boating in this area, since many of the structures are actually built BELOW the windy Amalfi Drive. The nuns who lived within the monastery walls invented the famed Sfogliatella pastry, celebrated every year by the village of Conca with a big street party. If you are planning a vacation to the Amalfi Coast, don’t overlook Conca Dei Marini as a base to stay; it truly is a peaceful inlet of serenity, culture and beauty.